I've bought quite a lot of gear from B&H in the past few months and been pleased with every transaction. Even a couple of returns went smooth as silk. This past week I was on the search for an affordable C Stand. Dang those are pricey! I did find one that look to fit the bill at a competitor's on-line store for a very attractive price, and as a bonus they were offering a rebate on a combo that included locking casters. Got the gear yesterday. First issue was packaging. POOR! The grip arm was jutting out of the box with a piece of packaging tape wrapped around the tip. Phew, no damage tho as far as I could tell. The big issue was the casters. They don't fit. So called Adorama, spent about a half hour in total figuring it out. Seems they don't have the proper size unless I was willing to spend approx. twice as much as the original set. So why did they suggest and include them if they don't fit?? Anyway to return them requires filling out a full-page RMA request, shipping at my expense, and since original shipping was free they will also deduct the price of what their shipping would have been had it not qualified for free from my refund. Really, for something not my error? Last edited by gatorguy; 08-12-2016 at 07:53 AM. So shortly after my post an Adorama representative reached out to me. She's explained that under these types of circumstances the customer is not expected to absorb shipping fees. If they are at fault they pay the freight. I gave her the order number and she'll no doubt look into why the mismatch on the casters to make sure other buyers don't receive the same incorrect product. I'm going to chalk this one up as an unfortunate but unusual set of errors on their part and as I told her give them another shot at my business when the need arises. It's a very encouraging sign when any company reaches out so quickly to address customer concerns. Some of their prices are really attractive compared to competitors so if the customer service is as responsive as they were in this instance I'm sure I'll be buying from them soon. I have had good experiences shopping at both stores. I tend to buy more from B&H, mostly out of habit I suppose, but Adorama has also treated me well. I've had great experiences with both B&H and Adorama. Bad things can happen at the best of places if people are involved...and people are always involved! I have no hesitation to buy at either place. BTW- Let me add that when I had my little downtown studio, I had all my printing done at Adorama...and it was just superb and very, very reasonable. Every print was also packed with great care and protection. Never had a client that wasn't thrilled with their quality work. I had good experience with both stores as well. The reason I choose one or another is the price, or perks. I've had a few issues with shipping (packaging) from Adorama. Boxes that look like they were used as a football in a pro game, poor internal packaging.. when I've complained on these occurances, their rep thanks me for letting them know.. yet then it happens again. They also have an issue with the accuracy of the items on their website (for instance, take a look at lens hoods for the 16-50 vs the 60-250). I've gone round and round with them over getting this corrected, but they never got it right. I don't think they could care less.. even after I provided an image of each lens hood and the proper model number vs what they had marked as that model. Feels like amateur hour over there. 1) They rated a 50mm 1.8 as a 9 or 9+ in the used store. When I got it (packaged very nicely) it was easy to understand that the whole lens was slightly bent (as if someone had stepped on it or sat on it.. something to crush it ever so slightly) causing the focus ring to be really stiff. They took it back without hassle though. 2) I also had to fight once for a rewards credit, on a different transaction, that B&H emphatically denied was offered at the time of sale, even though I recall it on the sale page (take screenshots folks). After going around the horn for over a week they very reluctantly gave it to me (around 30 bucks). But they made me feel like I was robbing them even after informing me they would honor the offer. It was a rather poor experience as a customer. That said, Adorama feels like a K-mart to me.. low end knockoff... if it were a department store. And I've had many more positive experiences with B&H than bad (even on used items). I just realize now that I must be very proactive in covering my behind when shopping with either of them (screen shots of sale offers, video record shipping box (and packaging) before and during opening, photograph/video record the items condition upon opening the shipping box, if any issues are found to document them in writing. Last edited by mee; 08-13-2016 at 10:32 PM. I've had a few issues with shipping (packaging) from Adorama. Boxes that look like they were used as a football in a pro game, poor internal packaging.. when I've complained on these occurances, their rep thanks me for letting them know.. yet then it happens again. They also have an issue with the accuracy of the items on their website (for instance, take a look at lens hoods for the 16-50 vs the 60-250). I've gone round and round with them over getting this corrected, but they never got it right. I don't think they could care less.. even after I provided an image of each lens hood and the proper model number vs what they had marked as that model. That said, Adorama feels like a K-mart to me.. low end knockoff... if it were a department store. I am so very sad to read that these have been your experiences; all Adorama packaging boxes are brand new, therefore any damage that has been sustained is down to UPS. Sadly, while we can complain about this we have no control over it. That being said, I absolutely understand why you would be frustrated by any less than stellar internal packaging that you described and I have already copied your comments over to the shipping manager. However, poor internal packaging really should not be the case, and I would be grateful if you could please email me: Helen@adorama.com at your earliest opportunity with any order numbers relating to items you have received packed in this way so that it can be taken up with the packer(s) concerned. It can only be a sporadic issue with the packing team, because as a matter of procedure we pack above and beyond the industry standard. Pillows are our choice of packaging because they are proven to be the best shock absorbers for all categories of product. Most packaging companies that come in and see our operation are taken back by the amount of pillows we use in one carton. They actually drool to try and get the business, because it is not the norm. The industry standard is to put the item in the box to one corner, and then fill the void with dunnage whether it is peanuts, pillows, foam, or paper. Our procedure is to blanket the bottom and the sides of the box with pillows, place the item in the middle and then fold over the pillows and add more to fill the box where needed. The only thing we don’t add any pillows to are those items that ship in the vendor box, and soft goods (t-shirts, backpacks, hats, etc). As I said, if an individual packer is not following these guidelines then we need to ID that person and instigate additional training. You may be surprised to note that while most manufacturers pack cameras and lenses in shaped polystyrene inside the box, they deliver the boxes to us in shipping cartons packed side by side, without any additional packaging or protective insulation at all, either in between the boxes or on the outside of them. So I guess the major manufacturers feel that the packaging they provide is sufficient to protect the unit inside. Regarding images on our website that are incorrect; again, please email me: Helen@adorama.com with the relevant SKU #s and I will have this corrected tomorrow when the office re-opens. Once again my apologies for any disappointment that has been caused, and I very much look forward to hearing from you. Last edited by Helen Oster; 08-14-2016 at 03:32 AM. ......when I had my little downtown studio, I had all my printing done at Adorama...and it was just superb and very, very reasonable. Every print was also packed with great care and protection. Never had a client that wasn't thrilled with their quality work. That's very good to hear....thank you SO much for taking the time to post. I've copied your kind comments to my colleagues over at the AdoramaPix lab, and for sure they will all be delighted. I do hope Gatorguy takes a few minutes to respond to Helen, so she can help out. If not, why complain? I've found Adorama to go the extra, extra mile (especially Helen) to assist me. I had a camera lens stolen when UPS just hung it off my mailbox, 2 miles from my house. Helen got a replacement on the way immediately, without waiting for the claim to go thru, which would have taken weeks/months. To me, this is why Adorama is tops in my shopping. We are very fortunate to have both of these companies to shop from! I've got to agree with Gatorguy, and of course thank Helen. Without Helen coming in and "fixing things" Adorama seems to default to a more careless state. It takes a few weeks or months, but it seems that Adorama has a chronic problem in certain areas. Helen always fixes things for us, so we have that. Sure B&H messes up now and then, but overall B&H gets it right in more ways than Adorama. When it comes to shipping, this happens regularly with Adorama. I'd really love to know why. Is it training? Salaries? Software? Ownership? Location? Pentax hate? Carelessness? I speak from experience (from Adorama), that more than once, my package has come in less than ideal packaging. Without Helen, we would be in trouble. Helen is a first class customer service representative, Adorama shipping not so much. Last edited by LaurenOE; 08-17-2016 at 08:05 AM. I've found Adorama to go the extra, extra mile (especially Helen) to assist me. I've got to agree with Gatorguy, and of course thank Helen. Without Helen coming in and "fixing things" Adorama seems to default to a more careless state. It takes a few weeks or months, but it seems that Adorama has a chronic problem in certain areas. Helen always fixes things for us, so we have that. .......When it comes to shipping, this happens regularly with Adorama. I'd really love to know why. Is it training? Salaries? Software? Ownership? Location? Pentax hate? Carelessness? I've copied your comments to the shipping manager ....... The packers are trained and there is monitoring in the warehouse - and for sure we'd love to get all packaging complaints to a bare minimum (if not eradicated completely). A major factor is of course that we are relying on humans, but it sounds from what you are saying that either you are ordering a huge amount of gear from us, or something is going horribly wrong with certain packers. Last edited by Helen Oster; 08-18-2016 at 03:15 AM. Yes I've responded to Helen, in fact within minutes of her reaching out to me. You apparently missed or didn't read my second post which mentioned that. Since then I've written her back one more time. I've not sent her the picture of the poor packaging yet but will be sure to do so in the next day or so. As for the casters which was my biggest concern she did say they were looking at why those are supposedly matched to the C Stand but don't fit. In any event as mentioned in my first post those casters do fit one of my light stands since they have smaller .22mm diameter legs so that's where they are going. EDIT: I've now sent the photo of my C Stand package as rec'd. We already had that conversation on August 1st - 3rd 2015. You passed the buck off to someone named 'Jorge C' who seems to have done nothing with the information. And you stopped communicating with me. So what good is jumping through the same hoops with you and your company going to do? You are great at communicating on the various internet forums, but I'm afraid it is mostly just lipstick.. there is little to no resolution behind the scenes. I have identified your previous emails to me. This was nothing at all to do with our packing department! As you noted: "By the time I got to the package, the box had been ripped open. The camera, lens and bag were stolen from the shipping box." On 12/4/15 I wrote to you you: Thank you, Mee. My colleague, Leah, will take over from here, and will be in contact with you directly once she has had a chance to review all the information. My colleague, Kimberly, called you for additional information regarding the condition of the box to enable her to process a shipping damage claim. Are you saying that this was not done, and that you were not reimbursed by the carrier for the items you reported stolen? No, you haven't identified previous email from me. Those aren't related to me at all. The last camera I ordered was from B&H (not in 2015) and I've never had any stolen items. 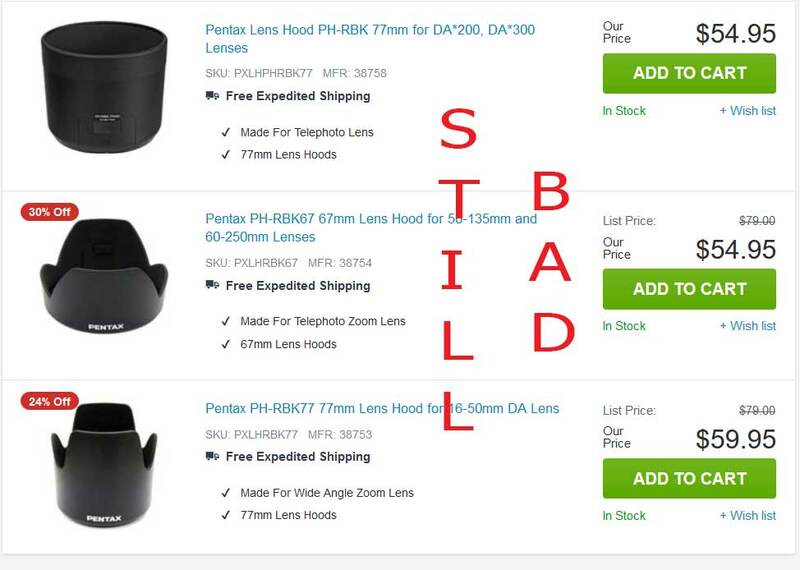 The email to which I'm referring, to you at Adorama, were about incorrect listings (images to text) of Pentax lens hoods on your website not about damaged/stolen items or packaging. Further, it is poor form to post detail of private email (from anyone) in a public forum... for the example you are currently showing. If you are looking to save face for your company, it would be smarter to sort it out in private, then post the results in public. But since this is already drawn out here we go.. This is the visual aid I sent to Jorge C last year after he confirmed what I discovered (inaccurate listings from image to text for lens hoods)... that was last year... they are still wrong. 2015 (B&H who gets it correct on the left, Adorama who does not on the right). Bottom image is your site currently (also your prices really jumped). Last edited by mee; 08-18-2016 at 07:47 AM. All times are GMT -7. The time now is 07:27 PM. | See also: NikonForums.com, CanonForums.com part of our network of photo forums!